Antpitta being fitted with transmitter. 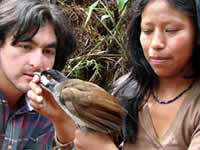 The Jocotoco Antpitta is the emblem of Fundación Jocotoco (FJ), WLT's partner organisation in Ecuador. This species of antpitta was only discovered in 1997 and FJ's first reserve at Tapichalaca was set up to protect the critically threatened habitat where they were found. Almost the entire known population of the antpitta occurs in this one location and the best place for viewing them is in an area of bamboo thicket quite close to the visitor lodge. In order to reduce disturbance in the forest the antpittas have been trained to answer a call from the warden. 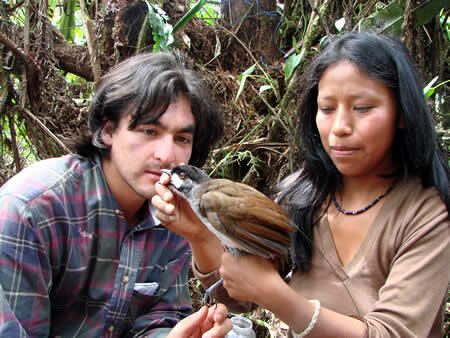 Here an antpitta is being fitted with a tiny transmitter so that its activities can be monitored more closely. 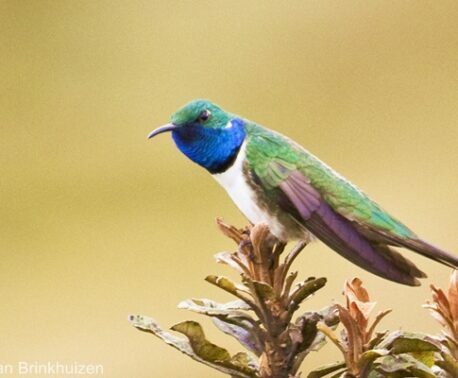 Very little is known about the habits of endemic birds in the Ecuadorian reserves and learning more about their movements will help identify areas which need protection in order to help their numbers increase.